Birdman, or (The Unexpected Virtue of Ignorance), has been on a winning streak since its release in October 2014. The film has been received several prestigious awards−notably at the Academy Awards, the Directors Guild Awards and the Producers Guild Awards. 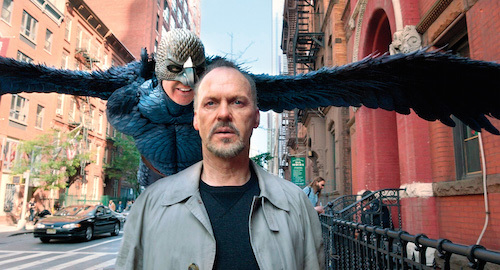 Birdman took home the Best Picture Award at both the Academy Awards and the Producers Guild Awards. The film’s director, Alejandro G. Iñárritu, took home the Best Director award at the Academy Awards and the Directors Guild Awards. Although the film only appeared at a limited amount of theatres, it has grossed over $94 million worldwide. Many audience members experienced nostalgia while watching Keaton’s performance in this film due to the close relation between the story line and the fact that Keaton once played Batman in many of the Batman films in the early 1990’s. “In terms of the parallels, I’ve never related less to a character than Riggan,” said Keaton in an interview with Entertainment Weekly. In this dark comedy, Riggan Thomson (Michael Keaton) is a washed up film actor that is best known for his role as “Birdman” in a series of popular action movies. Thomson has given up his role as Birdman, for a new challenge in producing his own off-Broadway theatre production that is rapidly failing to meet the desires of the harsh critics of New York City. In his attempts to forge for success in the theatre, Thomson is being mentally haunted by Birdman, who is guilt tripping him into coming back to the big screen. Between the failing ratings of his show, and the guilt he is feeling from his alter ego, Thomson is overwhelmed by the pressures of show business and threatens to take his own life. Despite the lack of publicity for the release of the film, Birdman had a well-rounded all-star cast including: Michael Keaton, Emma Stone, Edward Norton, Zach Galifianakis and Naomi Watts. Stone was also nominated for Best Supporting Actress at the Academy Awards for her performance as Sam, Thomson’s drug addicted daughter, who also works as his assistant. Galifianakis, who is famous for his role of Alan in the comedy film trilogy The Hangover, delivered a relatively serious performance as Thomson’s best friend and lawyer. The performances that were delivered by the cast, as well as the directing talent of Iñárritu, Birdman is dark and satirical, yet inspiring for its audience members. It depicts the struggle of not only a film actor, but of a man that is striving to shed his past in order to be respected by the world for the person that he truly is instead of the character he has played.